In a sort of recognition of the European Space Agency’s Rosetta mission landing their Philae probe on a comet after a 10-year flight, we’re posting about NASA putting up tons of space and space program sounds online, and they’re free to download. Create Digital Music laid out the links and explanations of what’s what (scroll past their sampling to find the main URLs). Readers into experimental music, noise, or sci-fi metal might be interested in messing with this audio. The comet is making some noise on its own. ESA wrote on its blog, “The comet seems to be emitting a ‘song’ in the form of oscillations in the magnetic field in the comet’s environment.” Play the brief “song” at the post. 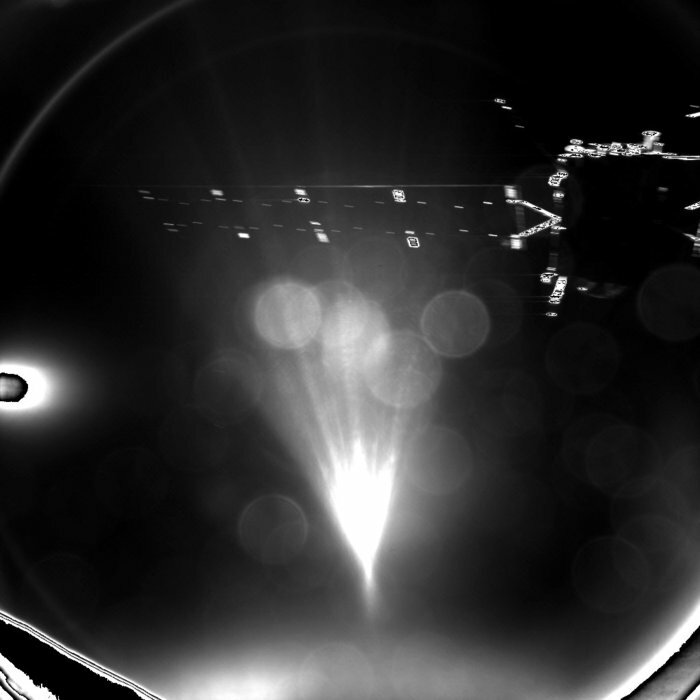 Image: “Rosetta’s lander Philae took this parting shot of its mothership shortly after separation,” copyright ESA/Rosetta/Philae/CIVA. This entry was posted in Science + Music and tagged archive, comet, ESA, nasa, noise, space by Editor. Bookmark the permalink.